Welcome to another Brian’s Travel Spot, the occasional series documenting my increasing travel experiences. This year it’s gone from principally recording the trips themselves (its original purpose), to discussing the various flights I’ve been taking, starting with a pair of flights out to Phoenix and culminating in three trips from Manchester to Chicago, each one flying a different route with a different airline, United, British Airways and American Airlines. In between, when returning from Vietnam, I flew long-haul flight in business class for the first time. Fortunately since this was the last trip of the year and I always aim to underspend my budgets just in case, I had enough left to cover a return trip in business class. Before anyone thinks I could have flown in economy and got my sleep there, it’s not that simple. Unfortunately I have a medical condition which means that I’m prone to blood clots, so sleeping in an economy seat is out of the question. Three airlines fly direct to Shanghai from Heathrow: British Airways, Virgin and China Eastern, with China Eastern coming in at exactly half the price of the other two. While I probably had just enough in the budget to cover a British Airways/Virgin flight, I still can’t bring myself to spend more money than I need to, even when it’s someone else’s money! Having flown China Eastern the first time I went to Shanghai last year, I was very impressed and was more than happy to fly China Eastern again. What clinched it was the timing of the flights: while British Airways and Virgin both left Heathrow in the afternoon, arriving mid-morning Shanghai time, the China Eastern flight left at nine o’clock in the evening, arriving in Shanghai just before four o’clock in the afternoon, with a 10½ hour flight time. Since the main aim was to get some sleep on the flight, leaving at nine o’clock appealed much more than mid-afternoon, when I wouldn’t be tired. As it was, I was really grateful that I was flying business class. I had a really stressful few days in the lead-in to the trip, resulting in me getting very little sleep and rushing like a mad thing to catch the flight. Having the few extra hours that the evening flight gave me made all the difference. I’d hired a car for the weekend, the idea being to drive home, pack, then drive to the airport, where I’d drop it off before catching the flight. Computer problems saw me leaving the house at 6.45, which was almost an hour later than I’d planned. Fortunately, I can get from my house to Heathrow car hire in just over 30 minutes, but it was still cutting it fine and is not to be recommended! The good news is that from that point on, everything went very smoothly. There wasn’t much traffic, there was no queue at the car hire drop-off (although I didn’t have time to fill the car up before dropping it off, which cost me a pretty penny) and the bus turned up immediately, so by 7.40 I was at Terminal 4. When I got to the check-in desks I was the only person there, so I didn’t need my business class queue-jumping privilege, but I did get to go through security in the fast track line. Even allowing for taking my bag to the oversized bag drop and having my laptops and camera pulled aside for screening during security (even the lady doing the screening didn’t know why) it took me under 15 minutes from arriving at check-in to clearing security, which has to be a record! Although the flight was due to board in 25 minutes, I didn’t want to miss out on the business lounge, which turned out to be a good choice since it was the best of the four I’ve been to, beating the previous front runner, the Vietnam Airlines lounge at Hanoi. Since I can’t resist free food, I had a chickpea curry and an excellent sweet temptation cake, the curry being the best airport food I’ve ever had. While it was a lovely experience, it was also quite annoying since my original plan was to get to the airport and spend an hour relaxing in the lounge! Oh well, you can’t have everything and, to be fair, it was far better than having to spend my time at the gate. Although I didn’t look around much, there seemed to be far too few seats and I doubt that there was power. When I arrived, there was a long queue for economy boarding, but I was able to walk right up to the business check-in desk and straight onto the plane. Insert smug face here. With all that went wrong, I was really grateful that I was flying in business. Having arrived at the airport very stressed, the whole in airport experience was the least stressful I’ve ever had which is saying something since I find airports inherently stressful places. You can see what I made of China Eastern’s 777 business class after the gallery. When I’m flying economy, I’m obsessive about getting the right seat (exit/bulkhead row and on an aisle) but when I’m flying business class, I’m less worried. Since I was away the weekend before the flight, I didn’t bother checking in on-line and took pot-luck with whatever the airline gave me at the airport. Of course, since I was probably the last person to check-in, I suspect I got whatever was left, although with that in mind, I was more than happy with my seat. I was flying on a Boeing 777-300ER, a plane I’ve become quite familiar with over the years, usually flying between London and Boston/New York, but always travelling in the back half! Up front on a 777 was a whole new experience for me and it was only the third time I’d flown long-haul on business class. All I can compare it with are my two previous experiences, flying on a Vietnamese Airlines 787 on my return from Vietnam on and a British Airways 747 flying from Chicago. The way China Eastern has its 777s laid out is interesting. There’s a very small first class cabin right at front, with just six suites, which then leaves space for an equally small business class section between first glass and the galley, which is where I ended up. The alternative would be to turn right as you come in, where you end up in the main business class section, all eleven rows of it. In contrast, this section has just two rows of seats, seating eight in all (two of which were empty on my flight), giving us an extra air of exclusivity. Of course, the advantage of turning left instead of right is that there’s no stream of economy passengers pushing past as you try to settle in. In terms of both the seats and configuration, the China Eastern 777 is very similar to the Vietnamese Airlines 787, with four seats per row, one each next to the windows and two in the centre, all facing forwards, but at an angle of about 30⁰. The best part about this configuration, compared say to the British Airways 747 (which was 2-4-2, with half the seats facing backwards) is that every seat has access to the aisle, so you don’t have to navigate past anyone to get out, a massive advantage when everyone else is sleeping! The configuration almost meant that each seat had its own overhead locker, which was really nice. The seat itself was a pod, like the 787, and so felt very familiar. It wasn’t quite as swish and the controls were slightly less daunting (which may have been down to familiarity). There’s plenty of storage space, with a wide shelf and a couple of little compartments, which is in contrast to the 747 where there’s really nowhere to put anything once you’ve converted the seat into a bed. Of course, I love having a proper table, one of the main advantages of business class for me! Although the table was fixed (in the 747 you could slide it back and forward), you can move the chair back and forward instead to get the perfect typing angle. The only minor complaint is that for the two seats in the centre, there’s no screen between them, but it’s more of a nice to have. Even the toilet in business class is nicer. I don’t remember the toilets being so nice on either on my previous business class flights, but this one was about twice the size of a typical toilet in the economy section of the cabin. Best of all, I could stand up straight in it (which I do remember from the 787). All-in-all, it was a very fine experience and highly recommended! You can see how I got on with the flight itself after the gallery. The flight itself, as I never tire of saying, was smooth and uneventful. We took off slightly after our scheduled nine o’clock departure, although we pushed back on time, eventually taking to the air at 9.15. The flight time was around 10½ hours and, with Shanghai being eight hours ahead, we arrived at about 3.45 in the afternoon on the following day. As you’ve already heard, I ate before I flew. Partly that’s because I can’t resist free food, but it’s also because I wasn’t sure what I’d be able to eat on the plane. As well as forgetting to book a seat ahead of time, I forgot to order a vegetarian meal and had to take my chances with the standard menu. As it turned out, since I eat fish, I was okay. Without that, I’d have been in a lot of trouble. The meal service started almost as soon as we took off. You definitely get a better class (and choice) of food when flying in business class, as well as real cutlery, which still amazes me. In this case dinner was a five course feast, with four choices on the menu for the main course, three of them meat and one fish. Our starters (prawns) were served over Holland, followed closely by a second course of seared scallops, soup and Parma Ham, with the main course (I had the salmon) arriving somewhere over Denmark. Cheese & biscuits (plus fruit) were served over the southern tip of Sweden and dessert (a choice of ice cream or cake: I had ice cream, having had cake in the lounge) arrived as we reached the Baltic. The main cabin lights were dimmed once the meal service was over, which was at eleven o’clock, just as we flew over Latvia and I headed to bed about an hour after that. I slept for maybe a shade under four hours, then had another hour dozing. I didn’t sleep as well I’d have liked, but I did sleep as well as I had expected. I felt the seat was slightly more confined than the equivalent on the 787, plus I was very hot, having been provided with something more akin to a duvet than a blanket. Despite all this, I still felt pretty good on waking, that little bit of sleep making all the difference. I’m not sure what the official policy was on breakfast, but everyone else in my little section was still sleeping when I was served. I suspect that the crew had noticed I was awake and decided to serve me to spread out the demand. As it was, breakfast was more akin to lunch (and, in terms of food, it was dinner in reverse, salmon followed by scallops). By the time I’d finished, everyone else was still asleep. My final act was to make some coffee, taking advantage of the additional space in business class to do it at my seat. As usual, I’d pre-weighed the beans, grinding them in my Aergrind and using my Travel Press in preference to my Aeropress since I find it a lot less messy! Initially the crew were rather concerned about giving me hot water, but this is another advantage of the Travel Press. Since it looks a bit like a thermal mug/flask, the crew seem much happier to fill it up than they do a metal jug! I then transfer the hot water back to the jug when I get to my seat. One closing observation is something I’ve noticed over the last 18 months when flying with Chinese and Vietnamese carriers: mobile phones must be switched off for the entire flight. This is in stark contrast to UK/US carriers, where you are free to use them as long as they’re in flight-safe mode. I’m not sure why, but I think it is to do with concerns over batteries overheating. Whatever the reason, it’s really annoying since, until it’s taken away from you, you forget how much you rely on your phone. For example, I use my phone to take photos (I used the DSLR this time, but only because I had the space in business class) and I also use it as an MP3 player. On top of that, I use it as a timer when making coffee (I had to count to 240 instead this time) and finally, I use it as an alarm clock. Probably just as well I didn’t sleep too well and woke up of my own accord! You can see how I got on flying back in business class in Part II of this Travel Spot. This entry was posted in Brian's Travel Spot, Shanghai and tagged Boeing777, BusinessClass, China2017T, ChinaEastern by Brian Williams. Bookmark the permalink. Hi Brian, thanks so much for this nice review of China Eastern business class! 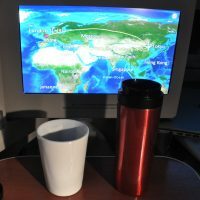 I’ll be flying business class for the first time (EVER) on a flight from Shanghai to LAX (after a short flight from the Philippines to Shanghai) and I have been looking for reviews online just to know what to expect. 🙂 Appreciate it! Glad to be of service. You should have an excellent time during your flight to Los Angeles. Do let me know how you get on!